The Southern Reach is a project partly by Alex Warren (creator of Quest), working with HarperCollins to promote Jeff VanderMeer’s Annihilation , part one of a trilogy. 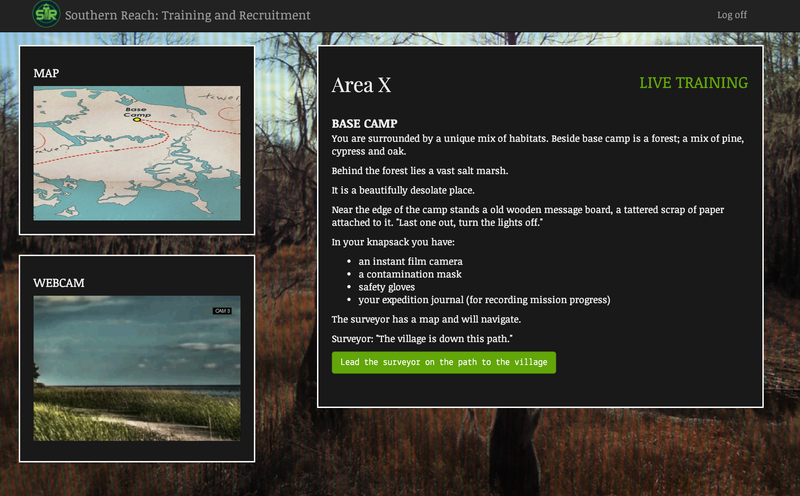 The premise appears to be that there’s a sinister area (Area X) into which a number of expeditions have gone — and perhaps not returned. There are hints that something has gone wrong there biologically, and that some of those who go in experience hallucinations or perceptual distortions. The game segment is fairly brief: it frames itself as a “training” experience, in which you’re taught to recognize lies, wear gloves before handling fungus, and calm the fears of your associates. “Training” is a trope I’ve seen several times in tie-in works (see also British Intelligence Officer Exam, which is a considerably deeper and longer story), presumably because it provides an obvious context in which the rules of the universe are presented to the player, but sandboxed in such a way that the player cannot affect the actual plot of the major work being advertised. The game story in Southern Reach feels a little bit unsatisfying all by itself, because it’s not really trying to answer any of the mysteries it raises — it’s perhaps up to the book to do that. There are a number of audio and visual elements, but the main body of the exploration is a straightforward choice-based game with textual descriptions, and it feels very classic IF-ish in the way that it describes new locations and moves you around on a map. I understand what the picture is trying to communicate. 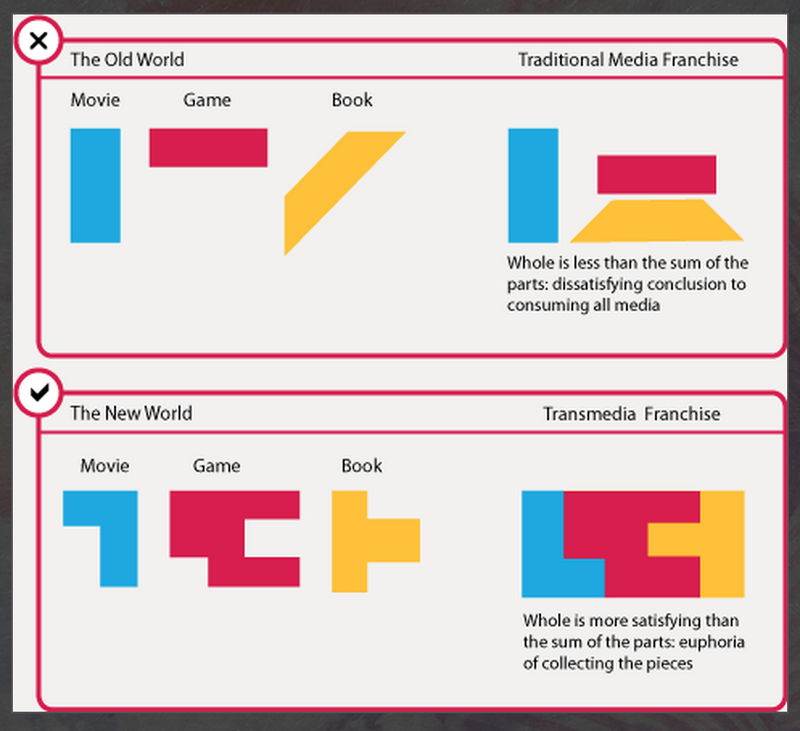 But what I see when I look at this is: the Transmedia Concept means that the contributing movie, game, and book are all individually misshapen, dissatisfying lumps. Is this actually better? Both as author and as player, I think I’d like the individual elements to be good in themselves, as well as (possibly) a cool participation in a whole; and if I have to choose whether they should be good in themselves or good only in concert, I think I would actually prefer that they each be individually high-quality experiences — because the set of people likely to encounter only one is higher than the set likely to encounter all three, and because someone who has a not-totally-compelling experience with a part of a transmedia entity is thereby the less likely to look for the others (I would assume). I certainly wouldn’t go so far as to say the Southern Reach game is a misshapen lump. If this were a standalone IF game, I would at the very least be saying, “hey, look, here’s an interesting IF UI that you haven’t exactly seen before.” But it’s definitely unfinished and dependent — and at the same time, it didn’t tell me enough about its world, or get me to care so deeply about its characters, to get me to buy the book. Other people’s mileage may vary, though. This entry was posted in CYOA, interactive fiction, tie-ins by Emily Short. Bookmark the permalink. I’ve dreamed that I responded to this. I see no reason why they *can’t* be right. I imagine a large creation with side-stories that give greater insight into the meaning of the main story. Not necessarily prologues and epilogues, but stories that provide context to the characters decisions and environment. However, I expect that as it is mostly marketing and buzz-generation, they won’t ever be right.